An easy card to make your mom for Mother's Day. This is an inexpensive craft to make if you don't have a lot of money to spend on a card. The pot scrubbers only cost $1.00 for 4 in a pack. Maybe the kids could make one for Grandma, too. Just change the poem to grandma instead of mom. Also if there's more than one child you could change all the "I" in the poem to "we." I made you this flower of plastic. I give it to you with this special wish. May it help you scrub each pot and dish. I want to thank you for all you do. Happy Mother's Day, I LOVE YOU! Fold the piece of cardstock in half. This will be your card. Cut out the poem with decorative scissors and glue it on the front of the card. Cut out the stem and leaves for the "flower" on a green piece of paper and glue these onto your card. Push the brad through the middle of the pot scrubber and attach it to the card. 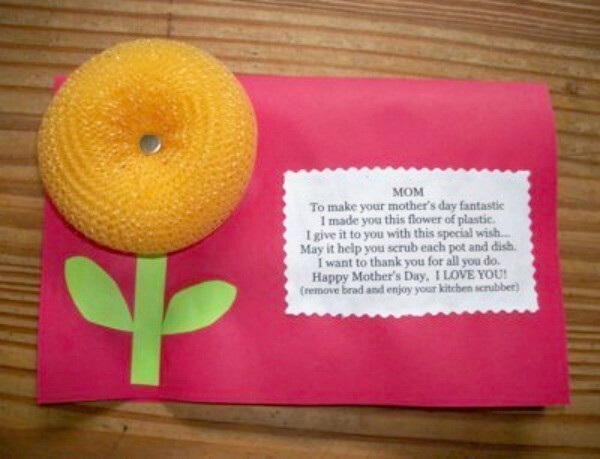 All you have to do is finish the inside of the card with a nice message and give it to mom for Mother's Day. child to give to Mom or Grandmother. Sweet project. 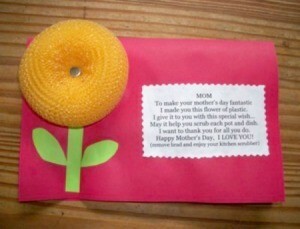 Think I'll get my 2 yr old Grandson to make one of these for his Mom. I love the verse too. You get my vote! If this doesn't just scream get in the kitchen, I don't know what does. It is cute but I would be very upset if my children gave me this.